Whether you need intricate detail work, or a simple “scuff and shoot” touch up, our paint and body shop crew can hook you up with the custom movie car paint job you need. Our expansive facilities have semi and tractor capable paint booths for large-scale jobs. We specialize in high-end peel coats, custom paint, vehicle color matching, and bodywork. With an enormous pantone library at our fingertips, our picture vehicle paint and body shop specializes in full restorations, airbrushing, and pinstriping. Whether your production needs an old school show car, or something with a more exotic flair, our team has experience to get the job done right and the ability to match any color, factory of custom. Whether you want to touch up some typical production wear or tear, or need to repair crash-scene wreckage, our body department can get your vehicles back into tip-top shape. Our experts can quickly repair anything from a minor dents to full body panels, so you can get your car back on the set in no time. 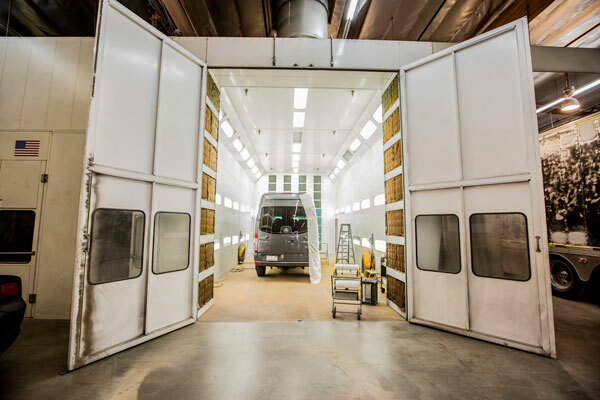 With the largest paint booths in the business, including our 55 foot booth, our team can handle the biggest custom truck paint jobs, no matter the size. From school buses to the food trucks of the future, custom designed prop vehicles to unique corporate builds, Cinema Vehicles is one of the only picture vehicle paint and body shops with the experience and facilities required to tackle large-scale custom paint projects. If you are looking for a temporary color-change option, peel coats may be the best solution for your production needs. Peel coats allow you to you change the color of a vehicle and then remove it cleanly, leaving the original finish untouched. Our peel coat services are not limited to cars; we can create custom peel coats for trucks, boats, airplanes — you name it! Whether you need a fleet of identical vehicles, or a perfect replica of an existing car, our picture vehicle paint and body shop has the talent and resources to get the job done. From a brigade of Peacekeeper trucks in The Hunger Games to the replica of the iconic Eleanor in Gone in 60 Seconds, Cinema Vehicles is Hollywood’s go-to custom car builder for matching picture car paint jobs. Since 1975, Cinema Vehicles has been building its reputation as the largest and most reliable picture car company in the entertainment industry. Our family-run business continues grow with the most experienced custom fabrication team in the country. Contact us today for a free estimate and to learn more about how Cinema Vehicles’ custom movie car paint jobs today.